A leading paediatrician has warned of the dangers of lithium batteries after two children swallowed them and died. Dr Kate Parkins said, in the last 18 months, another five children in Greater Manchester have also suffered life-changing injuries as a result. She said the button-shaped batteries "look like sweets" to children but can cause severe internal bleeding which medics struggle to treat. Lithium batteries are found in items such as toys, keys and smartphones. Dr Parkins, a lead consultant for the region's Paediatric Intensive Care Transport Service, is calling for a national campaign to highlight the dangers. "They look innocent enough and therefore nobody thinks to put them out of reach from children," she said. "It had been removed and then, about a week later, caused catastrophic bleeding which we couldn't control." The most serious cases are associated with Lithium button batteries larger than 20mm (the size of a 10 pence piece) which can cause severe injury within two hours. And they do not have to be damaged, crushed or chewed to cause serious harm. "It's not what's inside the battery," she explained. "The battery sets up an electrical current which causes a build-up of sodium hydroxide which is caustic soda. "That causes a burn through the oesophagus, the feeding tube, and that can then burn through into major blood vessels and that's why the bleeding is then pretty much impossible to control and stop." The consultant at Central Manchester University Hospital Trust also wants to raise medical awareness "because a lot of doctors are unaware that this can cause harm either". Dr Parkins said in the second fatal case, medics did not know if the three-year-old had swallowed a button battery. "She suffered catastrophic bleeding which again with all medical intervention we couldn't control. "She died because of severe haemorrhaging, severe blood loss." Children who have survived have been left with "severe life-changing injuries", she said. "Two deaths is too many as far as we're concerned. Two or three patients having severe injuries is too many when it's something potentially preventable." 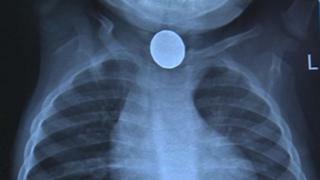 Central Manchester University Hospitals said the children treated after swallowing the batteries were aged between 12 months to six years old.